I had mentioned in my previous post on how to handle auditing of multiple files. While auditing the file loads, the name of the file loaded is stored in a sql server table once the data flow is completed successfully. Within the For Each Loop Container, I added a execute sql task after the data flow task. The execute sql task takes in the user defined variable sFileName and passes it as a parameter to an INSERT statement. This can be modified into a stored procedure in case there need to be more details added about the file loaded. Once the execute sql task runs it inserts the value of the user defined variable into a table. The table can be queried to find out what files have been loaded successfully. I have included the image of the Control Flow below. 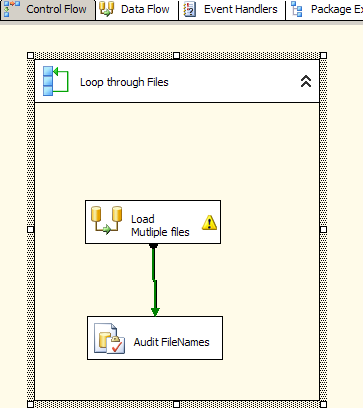 The name of the execute sql task is Audit FileNames.